Swanson Activated B-Complex is an advanced complex of B vitamins whose composition was optimised for maximum bioavailability. It is therefore a very effective way to increase the intake of vitamins that are extremely important for the functioning of the body. Thiamine (vitamin B1) – found naturally in meat (especially offal), legumes and nuts. A high content of carbohydrates in daily diet increases requirements for this nutrient. Increasing vitamin B1 intake is recommended for neurological disorders. Thiamine is involved in carbohydrate metabolism in the human body, thereby influencing positively energy production processes. It stimulates also the activity of acetylcholine, the main excitatory neurotransmitter. Thiamine deficiencies may cause systemic symptoms, such as lack of energy, inability to focus, cognitive disorders, a bad mood, and also contribute to depression. In addition, inadequate thiamine intake in diet promotes myocardial dysfunction. Riboflavin – known also as vitamin B2. As a component of redox enzymes, it takes part in cellular respiration and has thus a major impact on the functioning of the body’s energy metabolism. It influences beneficially nervous system function and is also necessary for maintaining healthy eyes due to its role in the retina. Along with vitamin A, it is responsible for healthy mucous membranes and epithelial tissues. Riboflavin is also required for activating vitamin B3 and B6. Niacin (vitamin B3) – found in the formulation as inositol hexanicotinate. It is very important for maintaining a healthy nervous system and affects your mood and emotional states. Some sources suggest niacin supplementation to combat depression. This form of vitamin B3 shows the ability optimise lipid balance and that is why it has cardioprotective effects. Niacin has also a crucial role in energy metabolism. It is a precursor to nicotinamide adenine dinucleotide phosphate and nicotinamide adenine dinucletodide, coenzymes which are extremely vital to cellular respiration processes. As a result, it improves energy production by the body and promotes optimal nutrient metabolism. Pyridoxine (vitamin B6) – valued for its ability to optimise nutrient metabolism. It is also essential to healthy functioning of the whole body and regulates the synthesis of many enzymes and hormones. It has a major impact on nervous system and immune function. It may have analgesic effects and is believed to relieve symptoms of premenstrual syndrome. It influences also beneficially the body’s mineral balance by increasing magnesium availability. Folate (vitamin B9) – folic acid in an active, methylated form. It is the best form of folic acid because it is biologically active. It allows individuals with methylation disorders to supplement effectively with this compound. What is more, folate promotes methylation. It affects thus energy metabolism and promotes cardiovascular health because it is involved in the conversion of homocysteine into methionine. In addition, adequate folate intake contributes to normal cell division. Deficiencies of active folic acid may promote the development of megaloblastic anaemia. Cobalamin (vitamin B12) – abundant in animal products such as meat, eggs and milk. Like folic acid, it is found in this formulation in a methylated form which ensures the highest bioavailability. Furthermore, it participates in methylation – it helps convert homocysteine into methionine (and thus exerts cardioprotective effects) and methylmalonyl-CoA into succinyl-CoA. Adequate vitamin B12 intake enhances effects of other B vitamins by promoting the body’s energy balance. Insufficient dietary cobalamin intake may lead to the development of megaloblastic anaemia. It impairs digestive and nervous system function and may also lead to mental disorders. PABA – para-aminobenzoic acid, commonly referred to as vitamin B10, but it does not technically belong to this group of vitamin. It can be classified into folic acid compounds. It is popular especially as a compound reducing symptoms of ageing. It helps maintain skin and hair pigmentation, promotes healthy superficial tissues and stimulates regeneration processes. Para-aminobenzoic is also suggested to prevent fertility disorders. PABA has also antibacterial properties. Pantethine – a form of pantothenic acid which shows a remarkable ability to regulate the lipid profile. It helps optimise the HDL-LDL ratio by promoting normal cholesterol metabolism in the body. In addition, it is a precursor to coenzyme A and maintains its high levels in the body. After combining with acetyl groups, it forms acetyl coenzyme A which participates in the citric acid cycle. As a result, it has a vital role in promoting the efficiency of mitochondria and their anaerobic energy production. Acetyl-CoA takes part in the synthesis of acetylcholine, the main excitatory neurotransmitter. Inositol – a compound isolated from inositol hexanicotinate (niacin). It is called vitamin B8, but it is a common name (it may be synthesised by the body). It belongs to a group of sugar alcohols. Its adequate intake is important especially to women. Inositol deficiencies promote the development of polycystic ovary syndrome. Its supplementation may reduce symptoms of premenstrual syndrome. What is more, it influences positively the functioning of the nervous system and may promote well-being. 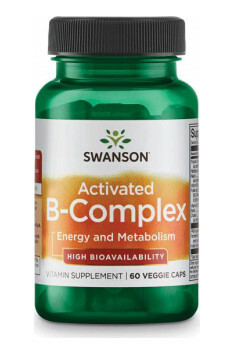 To sum up, Swanson Activated B-Complex is an advanced formulation which provides the full spectrum of B vitamins, both which belong to this group technically and are commonly referred to as B vitamins. It supports the functioning of the body, in particular by promoting the metabolism of energy substances. Due to the content of methylated forms of vitamins, it is extremely effective and well absorbed, also in individuals with methylation disorders. Take one veggie capsule one to two times per day with water. Some individuals may not respond well to methylated forms of vitamins. They should find another complex based on non-methylated form of vitamin B9 and B12. Due to the ability to increase energy levels, the supplement may cause sleep problems. Because of that, it is not recommended to take it in the evening. Microcrystalline cellulose (plant fiber), cellulose (vegetable capsule), may contain one or both of the following: magnesium stearate, silica. Benfothiamine - a highly bioavailable form of thiamine, also called vitamin B1. According to various sources, the advantage of its absorption over other forms of thiamine may be even of several times. Apart from this, thanks to its properties to dissolve in fats, it demonstrates high affinity to nervous tissue, as a result of better permeability through neuronal lipid membrane. Thanks to this, benfothiamine is indicated as the form of vitamin B1, which is the most suitable for people dealing with problems of the nervous system, which is the consequence of improper supply of thiamine. It positively influences energy metabolism of neurons. Benfothiamine is also indicated as a supplement, demonstrating positive influence on the treatment of symptoms of diabetes complications. It contributes to reducing neuropathy and retinopathy and decreases related pain symptoms. It also limits the pace of the process of protein glycation and supports carbohydrate metabolism of patients. Supplementation with vitamin B1 should be of interest to people who use proton-pump inhibitors and diuretic drugs. Choline citrate is a combination of choline with a derivative of citric acid. It is a new form of choline which comprises about 51% of this substance. This means that 1 g of choline citrate corresponds to about 500 mg of choline. Because of that, it contains more choline than e.g. bitartrate. Choline citrate does not only provide choline but also has one of acetyl groups necessary for the production of acetylcholine – the main neurotransmitter in the central nervous system that is extremely important for normal thought processes and supports cognitive functions. Choline citrate is combined usually with a more sweet ingredient to neutralise its sour taste. It is available in the form of monopreparations and also as a component of multi-ingredient dietary supplements targeted at improving focus, motivation and psychomotor skills.